I thought it’d be interesting to look at some download statistics for Hudson and CruiseControl, probably the 2 OpenSource CI tools with the most mindshare currently. Want to know more about CruiseControl, Hudson, and other CI tools? Meet the creators, contributers and users at the next CITCON conference in Melbourne, June 27th & 28th. Cannot make it to Melbourne? Then CITCON Amsterdam, October 3 & 4 is for you (I know I‘ll be there). Or CITCON Minneapolis, April 17 & 18, 2009. First, a warning: these data are not reliable. The sources have several disclaimers, so please take them with an healthy pinch of salt. Also, the oldest data for Hudson were from the beginning of the year, while those for CruiseControl were not available with the same details for all periods of time. This explains why the two graphs below do not span the same periods of time. Those stats do not include plugins for Hudson nor CruiseControl. The weekly downloads are interesting because the are made of constant chunks of 7 days. 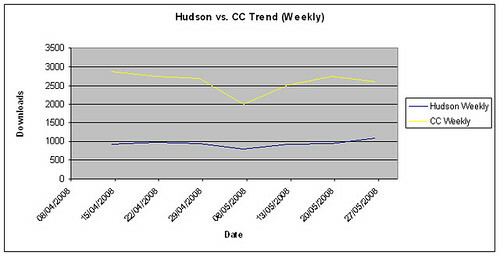 This graph, spanning only 2 months, suggests that CruiseControl has 2 to 3 times the number of downloads that Hudson has. However, its lead is getting smaller. The monthly downloads data are available from the beginning of year 2008 which is not bad. However, keep in mind that all months do not have the same number of days (I considered dividing by the number of days per month, but then I’d also have to control for the number of WE days in a month, which is too hard for me). 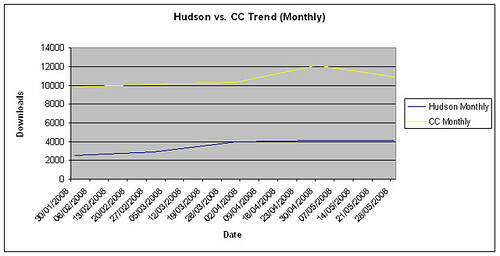 The trend is even clearer than for the monthly graph: the CC stats hardly make any increase, while Hudson gains almost 50% more downloads. Hudson has 2 or 3 releases per week, prompting many fans like me to download it very often, increasing artificially the popularity of the tool. CruiseControl has around 4 releases a year, making it much more stable (it also means that the releases contain much bigger changes). I speculate that recent Hudson users will be less tempted to update to the very last version as often as older users. Hudson is still hot and new, while CruiseControl is old news. A number of users want to be the first to talk about it, which explains why it has a disproportionate number of fans in some conferences. The novelty effect will decline in time. CruiseControl has a strong organization that keeps putting more money behind it, while Hudson is still very much controlled by its creator; Kohsuke’s employer has yet to define a clearer strategy for it — if they ever do so. So it is still very much possible for CruiseControl to eventually catch up technologically with Hudson. The statistics for CruiseControl only take in account CruiseControl Java. The .NET and Ruby versions, though distinct, add to the mindshare of the tool. The statistics for CruiseControl downloads are available here, while those for Hudson are there. This entry was posted in citcon, hudson. Bookmark the permalink. Interesting to compare the numbers. I’ve been curious to know Hudson’s download numbers. One interesting bit of data is that if you look at the entire history of CC the month with the largest number of downloads ever was this year. I was surprised at that, but I think it makes sense if you think that entire CI space is growing. However there is one point that you made that I think is wrong. CC is not where it is because Thoughtworks keeps putting money behind it. If you look at the entire history of CC you’ll see that the vast majority of work was done by the community outside of Thoughtworks. Their major contribution was visibility for the project via Martin Fowler’s CI article. There was a time when Thoughtworks Studios was going to base their commercial product on CC, and during that period they were active committers to the project. However they have changed direction and are no longer (or at least are not currently) contributing to the CC code base from their work on Cruise. Hm… Jeffrey, I think you’re right. I was under the impression that TW was still investing on CC via CC Entreprise. I suppose that may have changed since last time I checked (a while ago, I admit). You were asking about “Sun defining a clear strategy for Hudson”. Kohsuke used to work on Hudson only very part time but that changed very recently and Hudson is now his main responsibility, within a broader focus on Open Source Agile Development. It will be interesting to see how Hudson evolves now that he will have more time available to work on it. Also, there is a fairly active community that has been writing many plug-ins for Hudson. The plug-in architecture is a key reason why Hudson is moving forward as quickly as it does. Yes, I got aware of the change for Kohsuke shortly after this post. I am also very aware of the quality of the community around Hudson. I am very proud to be the contributor the French translation, plus the author of the Fit plugin. As I understand, you have some responsibility in overseeing the development of Hudson. Thank you for that. Pingback: ericlefevre » Contribute to Hudson! I just bumped into this post and wanted to point out that the Hudson stats have increased substantially. For example, this last week there were 3400+ d/ls. Unfortuantely I can’t check CC because SF’s d/l stat server is down. It is still the case that Hudson releases very frequently, so a direct comparison is (probably) not applicable.